Tankless water heaters, in comparison to the traditional water heaters, offers a variety of perks, such as endless hot water, additional storage space and lower utility bills, often helping homeowners save up to $100 a year, according to the U.S. Department of Energy. 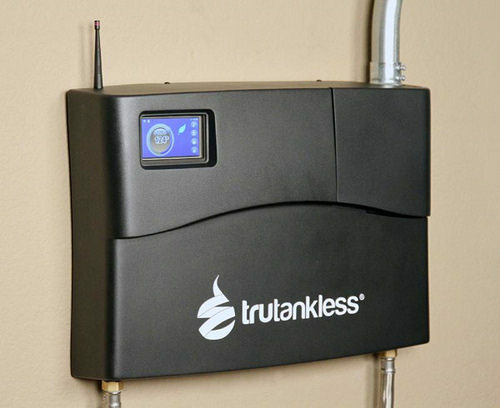 The cost of a tankless water heater will all depend on the professional company you hire, the brand they install, the type (gas vs. electric), your current setup and geographical location. For proper installation, many factors come into play, such as the climate, the local building code requirements, safety issues and the fuel type, according to the U.S. Department of Energy. In comparison to a traditional water heater, a whole house tankless water heater can cost as $1,000 for an electric version to as much as $3,000+ for a gas powered, including professional installation. As many jobs can be so unique, we highly advise you use HomeAdvisor.com to get as many free quotes from local contractors in your area. Here, you simply describe your job and contractors will reach out to you for free. Smaller point-of-use tankless water tanks, only designed for a single sink or faucet, for example, can cost as little as $150 to $350, depending on the brand. This price estimate, however, can greatly increase, depending on your home’s setup. Angie’s List, for instance, notes that not all homes are equipped for a tankless water heater, and in some cases, your home’s electrical system may need to be upgraded, essentially adding as much as $5,000+ to the estimates mentioned prior. The Chicago Tribune states the average gas-fueled tankless water heater can cost $1,470 to $2,500 in comparison to $865 for a 50-gallon storage tank. NOTE: Each brand has its own variety of models, with the total cost based on the size, the fuel type, energy efficiency and where you purchase it. A traditional water heater, depending upon the size, can accommodate anywhere from 30 to 50 gallons and the heated water will sit inside of the tank until you need it. Once the tank empties, then the tank will refill and the re-heating process will begin again. A tankless water heater, on the other hand, will use either gas or electricity to warm the water on demand, heating the water at the source, making it immediately able to use, meaning you will never run out of hot water again. On average, a tankless water heater will provide hot water at a rate of two to five gallons per minutes, and gas-powered, according to Home Depot, will produce a higher flow rate than an electric. While the installation costs seem to be high, this can often be offset by the energy savings in the future and will typically last longer because of it. A tankless water heater, in comparison to a traditional water heater, will only lose 5 percent of its heating costs, while a traditional will lose up to 30. With some models, you may need to wait up to a few seconds for the hot water to arrive, but unlike a traditional water heater, you will never run out of hot water. These units are much smaller than a traditional unit, meaning it will take up much less space. Just like a traditional unit, it can be installed in the attic, basement, garage or even outdoors. Depending on the unit you purchase, an electric can last up to 10 years, while a gas-powered can last up to 20 years, according to Bankrate.com. A tankless water heater is known up to use up to 50 percent less energy than a traditional water, helping homeowners save more than $100 a year. Not known for many disadvantages, for some, the price can be a turn off as it can be up to twice as much as a conventional unit, whereas others complain that the installation process can be much longer, often taking more than 10 hours to install for even the most experienced. Some brands do not have the capacity to handle high demands if you were to run more than one water source at a time, simply meaning you will not be able to do laundry and run the dishwasher at the same time, for instance. In some cases, some brands will take a longer time to deliver the hot water initially as the water needs to enter the exchanger tubing in order to start the heating process. In comparison to a traditional water heater, the water is sitting at the top of the tank, ready to go at all time. Due to this, you may encounter what’s known as a “cold water sandwich,” something that doesn’t happen with a traditional heater. According to the Star Tribune, hard water is known to destroy waterless heaters as the lime and mineral buildup can often cause malfunctions and will not be covered by manufacturer warranties. Tankless water heaters need to be drained and the filters need to be cleaned every month in order to increase its shelf life. First, you need to calculate the gallons per minute of hot water each of your fixtures inside of your home is going to use, and with this information, you will be able to determine your total gallons per minute. Refer to the table below to see the typical flow rates. Next, determine the difference between your groundwater and the hot water temperature you desire, which is often 120 degrees Fahrenheit. This number will be referred to as your required temperature rise. If your ground water was 60 degrees, for example, and you wanted a desired 120 degrees Fahrenheit temperature, then you would subtract 60 from 120 to get 60 as your temperature rise number. Use this image to determine your ground temperature. 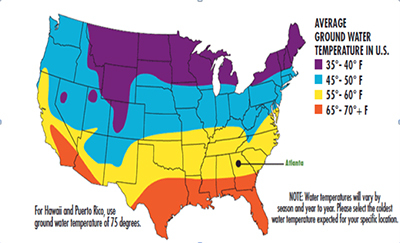 Lastly, use your GMP and the temperature rise to determine which tankless water heater will fit your needs. Any unit you want to purchase will often have labels on either packaging, on display inside the store or online. Your local city or the federal government may be offering tax credits at the time of installation. Check with your local utility to see if you qualify.